Born in Bell Buckle, Tennessee, Mabel Kate Whiteside developed her love for Greek at the Webb School for boys, from which she graduated at the age of 16. She immediately took up her first teaching position in Murfreesboro, before she continued her own education two years later at the University of Chicago. She came to Randolph-Macon Woman’s College, in Lynchburg, Virginia, in 1904. She taught Latin and especially Greek, her true love, for the next fifty years. She was also the College’s first Dean of Students, and served the College in a remarkable number of official and unofficial capacities. Prof. Whiteside’s legacy derives from her direction of the Greek Plays, starting with Alcestis in 1909 and continuing annually, with very few interruptions, through a performance of the entire Oresteia in 1954, the year of her retirement. The productions, which ranged throughout the extant corpus of Greek tragedy, and even into comedy, drew the attention of amateurs and scholars alike, in Virginia and beyond, who treasured the opportunity to see the plays outdoors in the original Greek with music and choreography composed for the occasion. The celebrated series of productions raised interest in Greek and the Classics on campus and in the community and made an impact on the lives of hundreds of students. To them, she was simply “Miss Mabel”—a trusted teacher who would let no participant of the productions fail; whose students would wait for her no matter how late she came to class; and who, though “apparently indifferent,” had a “genius for friendship, especially with her students.” Fifty years after her last play, alumnae still know their lines in Greek and speak in glowing terms of the professor who challenged and inspired them. Those alumnae have appointed the Dell, the natural space in which the plays were performed, with a stage, dressing rooms, and a beautiful curve of stone seats in Miss Mabel’s honor, and the venue is now the Mabel Kate Whiteside Greek Theatre. After her retirement, she was awarded the Gold Cross of the Royal Order of Benificence from King Paul of the Hellenes, as well as an honorary doctorate from Washington and Lee University. 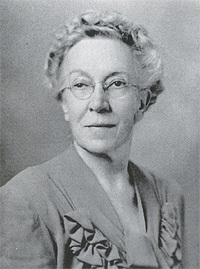 Roberta D. Cornelius, The history of Randolph-Macon Woman’s College from the founding in 1891 through the year of 1949-1950, (Chapel Hill: UNC Press, 1951). Alumnae Bulletin of Randolph-Macon Woman’s College, Volume XLIX, Number 3, April 1956. Conversations with Mabel Whiteside Ehlert.